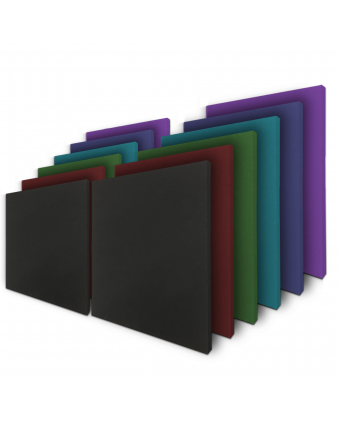 Combine form and function with Audimute’s AcoustiColor Design Acoustics! With a variety of shapes, sizes, and colors to mix and match, there’s no limit to what you can create! AcoustiColor Design Acoustics were created with the idea that acoustics could make a visual impact in addition to making a room sounds great. 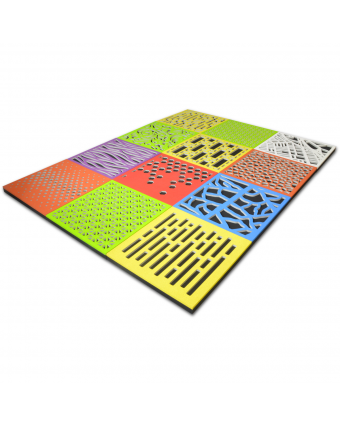 Taking away the frame, design acoustic panels are free to take form in a multitude of shapes and sizes, even tileable geometric shapes for a buildable pattern. 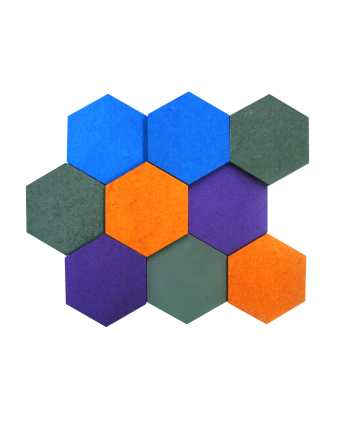 Audimute offers a variety of modular AcoustiColor designer acoustics that you can design in any scale. Each modular tile acts as a part of a whole – allowing you to build up your design and sound until you reach your desired results, with some shapes and tiles even butting up directly next to each other almost seamlessly! AcoustiColor design acoustics differ from panels in installation method, as well. While traditional acoustic wall panels hang like a picture frame using a Z-clip, design acoustic tiles and panels adhere directly to your wall (or even your ceiling!) using pre-affixed adhesive strips or industrial strength glue. For the first time, acoustics are as easy as peel and stick! The adhesive backing makes for a more permanent solution, sticking strong and holding up against brush ups and accidental contact. Install design acoustics in every space – from the home to the gym, office or restaurant – without a worry. Between panels, shapes, letters, and geometric tiles, Audimute has the prefect design acoustics for every space. Create bold floor to ceiling murals or intimate wall decor; coated in one of the many color options available via Sherwin Williams. 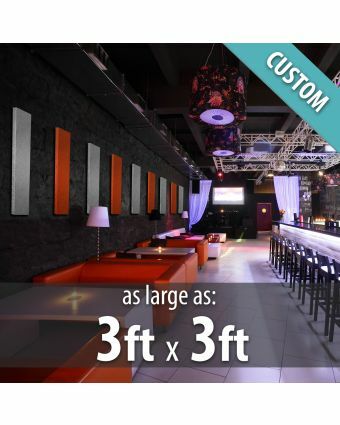 With custom small and large size ordering, your design acoustics are truly fit for your space and application to fit your décor and sound needs. Then choose a standard or custom color to stand out or blend in! Audimute’s AcoustiColor line of absorption products provides the opportunity to design your space tailored to your individual needs. 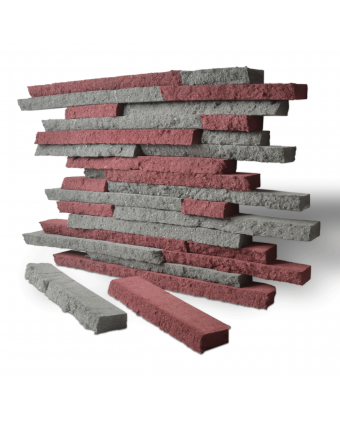 This includes standard and custom options for wall and ceiling acoustic design. Choose your size, shape, color and even the thickness. If you have a more custom request, or even just need more information, give one of our Acoustical Design Specialists a call at 866-553-4600. Stylish - A contemporary accompaniment to any space, available in hundreds of custom color options. 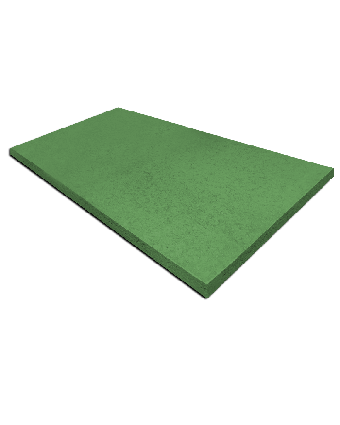 Green - Made with our eco-C-tex® absorption material, a blend of cotton and cellulose. 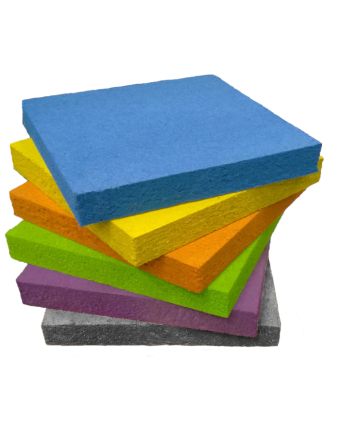 AcoustiColor products do not contain fiberglass. Effective - Highly effective NRC of .95. Handcrafted - High quality design and workmanship. Assembled by hand in the USA.